Reversible Blade Pocket Screwdriver. 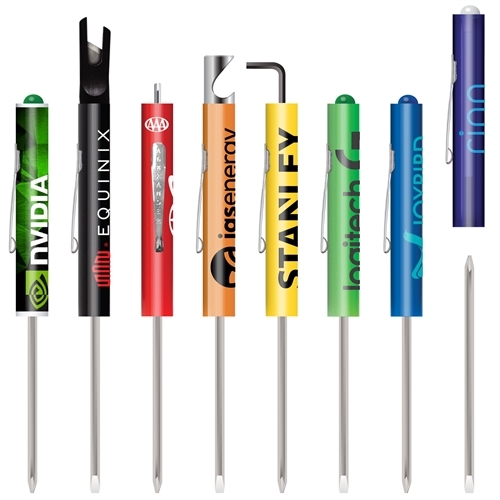 This custom printed pocket screwdriver is just over 5 inches long and has a pocket clip. 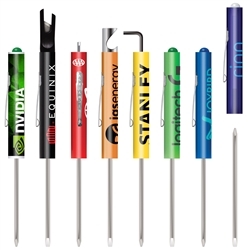 These screwdrivers are available in 11 Handle colors, with 5 blade options and 18 top options. Pocket partner reversible blade pocket screwdriver. The world's favorite pocket screwdriver! order was entered and expedited with great customer service - recommend to anyone with needs for these products. Great product. Wonderful end user graphics. Great experience from proof to delivery. We provided a rough proof using PPT and Pocket Scewdrivers were able to very quickly use our logo and text to develop a proof. We had no changes and were able to go to production within a day. Shipping was quick and we could not be more happy with our engagement. for the application and were delivered in a timely matter.